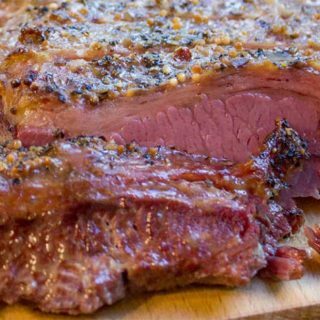 Crispy Slow Cooker Corned Beef with a crispy crust. No soggy Corned Beef, even from a slow cooker! Add corned beef, fat side up, to the slow cooker. Add the minced garlic, spice packet, sugar and pepper to the top of the meat and rub on. Add the vinegar and bay leaf to the side of the corned beef and add just enough water to come up about 25% of the way to the top of the meat. If for some reason the corned beef is not browned on top, or enough to your liking, put under a broiler (6-7 inches away) for 1-2 minutes. Leave the oven door open a bit so you can look in, this isn't something you can leave unattended.